1. Do you hate happy clappy church music? Well no I don't hate it. I can tolerate it much more than my hubby can. Divine Liturgies (should be) are chanted without any other musical instruments so the clappy part of happy-clappy does not lend itself to chanting. 2. What is your priority: eating or sleeping? Totally sleep. Some nights I can sleep for 5-6 hours and other nights I can push 8-9 (two night ago... ehem). As of last week I made this profound discovery that I must forego some sleep to be prepared for the day. I know you veteran moms already know this but I HAVE GOT to be up 45 min-1hr before my kids. It totally changes my mood and the morning outlook. E - Does not care one way or the other. She picks at her food and I cannot figure out how she maintains any weight. R - EAT. Eat oh my goodness. This child used to wake up whine for her cup (until she learned the word) and would shake as she gulped down the first sips. She was a cup-a-holic. I even asked the pediatrician about it (he said not to worry). Oh and R has finally gotten to the point where Papa can eat dinner with her again. 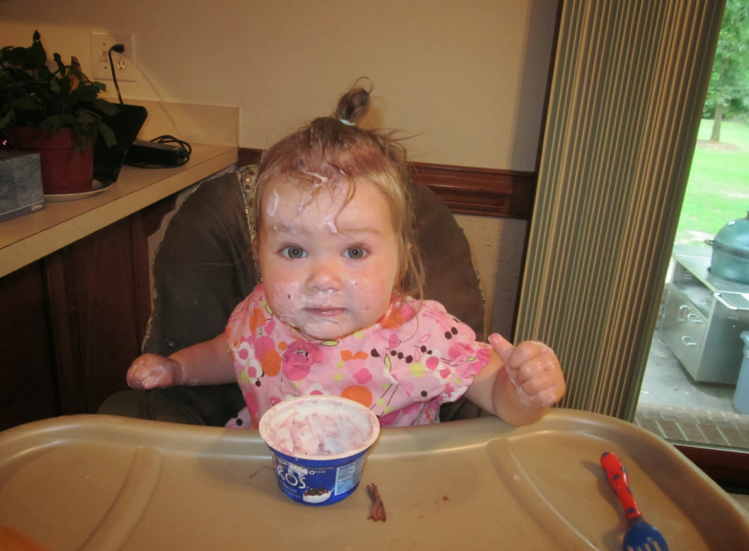 Last summer she would scream EAT EAT EAT until she was in the chair and call for food. It was a generally unpleasant experience and we are hoping that M will not follow suit. M - Eater. M is not much into naps. Which is of course my fault for not being a bit more militant about it but her demeanor is much more on the calm side even when she is sleepy. 3. What type of milk do you drink in your house? I've been meaning to do a post about this. Lee and I did a blind taste test of organic milk versus regular milk and it pretty much did not compare. The non-organic milk had about no flavor compared to the organic. That being said, I will buy the regular milk if it is on sale or there is a coupon for it. The organic milk is much more pricey but we do splurge on it. Also, for Lent Lee drank Almond milk - I liked the idea of it because it has more calcium etc... but the pediatrician said the sugar in it is fructose as opposed to lactose (in cows milk) sooooo he would not 'endorse' it wholeheartedly so cows milk it is. 4. What is a book that changed your perspective on something? Well that's an interesting one. I think I'll answer with two because I have not finished either of them (but want to). A. Catholic Education Homeward Bound. Still not hook-line-and-sinker on this homeschooling bandwagon but this book has changed my perspective on why families are drawn to homeschooling. 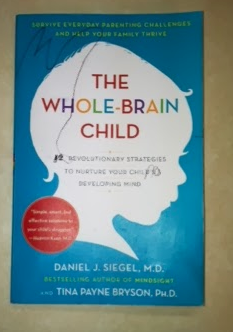 This book is great for learning about how to effectively communicate with your kids on a brain-level basis. Upper and lower brain. Right and left. Who knew it is all connected? 5. Who is your favorite saint? Man this is a tough one. Off hand I would have to say, St. Monica because of her perseverance in prayer to not lose hope in her son (now St. Augustine) and his faith. Side note, Papa would like to note his favorite saint as St. Basil the Great. His liturgy is long but a goody and is used throughout the Eastern Catholic and Orthodox worlds to this day. Unsweetened almond milk is tasty and has less than 1 gram of carbohydrates and ) grams of sugars. Catholic Education Homeward Bound was one of the first books I read about homeschooling, and I found it very informative. I also enjoyed A Haystack Full of Needles by Alice Gunther and Real Learning by Elizabeth Foss. I'm not a super fan of almond milk and neither is my oldest but I mix it half and half with regular milk. I was very surprised the pediatrician did not recommend it. 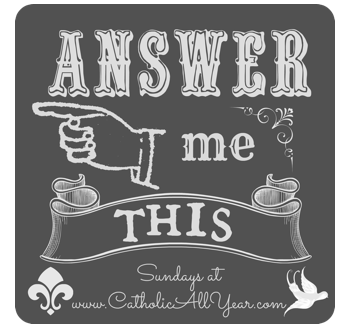 Have you read Homeschooling in Your Tiara? I am thinking that one might be a good one too! That book looks really interesting...I bet I would like that.